Living green means practicing our faith through caring for creation. Green Living provides concrete ways to green our lives as stewards of the earth. 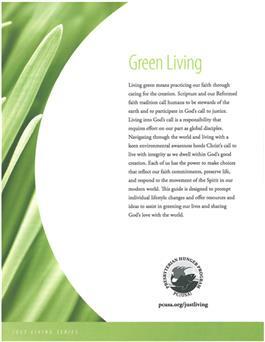 This guide is designed to prompt individual lifestyle changes and offer resources and ideas to assist in greening our lives and sharing God's love with the world; sections include Green Consumption, Green Transportation and The Green House Effect. Part of the Just Living series from Enough for Everyone and the Presbyterian Hunger Program.